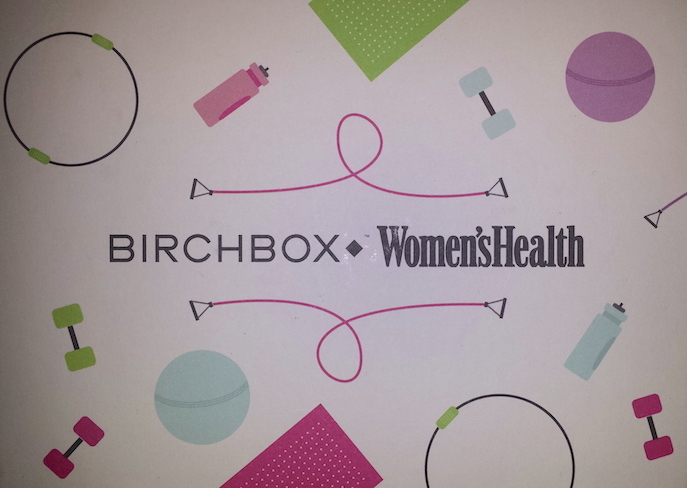 The first Birchbox of the year is a team up with Women’s Health magazine, bringing us all a collection of products to help us refresh and even to get into shape. It’s a good idea for the first box of the year when we all start off our New Year resolutions, a large number of which will be based around improving some parts of our lives (*cough cough* we all start going to the gym and eating healthier food)! 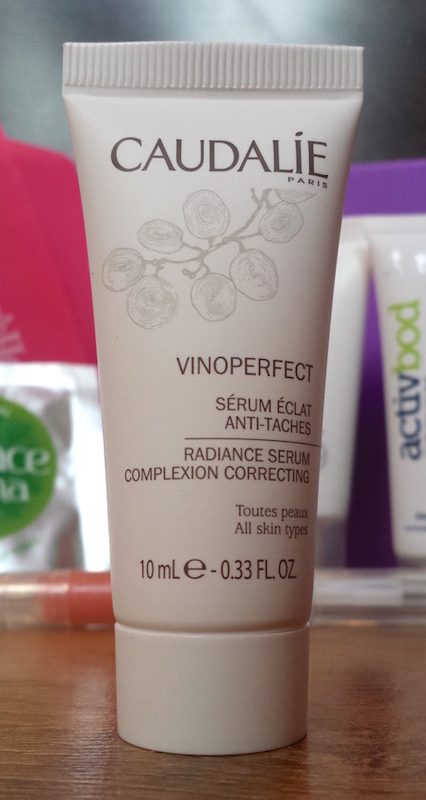 Caudalie Vinoperfect Radiance Serum is an oil-free product designed to provide an even skin tone and glowing complexion that is suitable for all skin types. It is free of parabens, SLS and petrochemicals. Personally, I tend to avoid radiance serums as I don’t usually get on with them too well. I have oily skin and even when a radiance product is aimed at all skin types I still tend to become overly oily when I use them. With that said, I always give them a go when they arrive in my Birchbox. Whilst my skin felt softer for the first half of the day, as time went on my face was becoming incredibly shiny and oily. I have recently been battling dry patches (thanks, pregnancy!) and my oily skin has been mostly under control. After using this my face was the oiliest that it has been in quite a while, and the only thing that I had done differently was to use the Vinoperfect Radiance Serum. In addition to this, my face also had a small breakout. This is another thing that I haven't had to deal with in a while and the only difference in my routine was this product, so I just don't think that my skin seems to get on with it. This does not mean that I cannot see the benefits of it for other people, though. For people with a normal skin type or dry skin, this will help to provide needed moisture and hydration. I don’t particularly recommend it to those who have oily skin like myself, but of course other oily skinned people may get on with it just fine. If you do have oily skin and want to try it, perhaps try to find a way to test it before paying for a full-size version. Sadly, due to the way my skin wasn’t getting on with it, I can’t really report back on any of the other effects of the serum. I’ve heard a lot of good things about it otherwise though, but I just don’t think that it is for me! 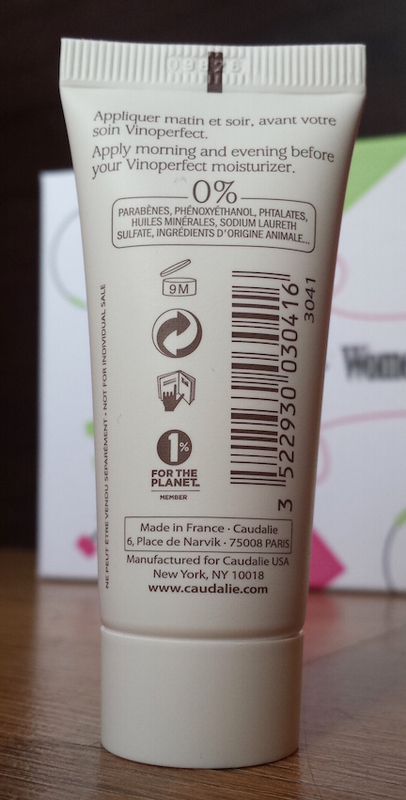 You can purchase a full-size, 30ml bottle of Caudalie Vinoperfect Radiance Serum for £45 from Birchbox. Stila’s Lip Glaze is a bestselling, cult lip gloss that comes in a range of suit-all, pink-hued shades. They come in a handy, pen-style applicator with a brush on the end for easy application. Admittedly, I have never tried out a Stila Lip Glaze. I have seen them around a lot and have considered purchasing one once or twice, but I simply just never got around to it. Thankfully this is no longer the case. 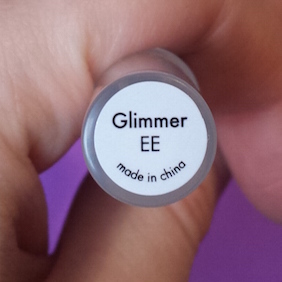 I received the shade Glimmer which is a really sheer pink shade that contains lots of iridescent glitter. To use you need to twist the end of the pen until you begin to see the product appear at the top of the brush. When this occurs you need to use the brush to apply to the lips. Once applied it looks subtle and casual which is good for day time wear. It stays put for quite a while as well which is always great news, but I found that it began to become clumpy when I was eating or drinking. I also find the Lip Glaze to be quite thick and sticky. This, I assume, is why they last so long, but I can imagine it being very annoying if you have longer hair that is likely to get stuck in it on a windy day! Overall though I quite like the Stila Lip Glaze. I wouldn’t choose to wear it if I were going out for dinner, but maybe for casual days out as they don’t need to be re-applied often. I'd probably also choose a different shade if I were to make the decision myself, but Glimmer is nice all the same and I'll still be wearing it. You can purchase a Stila Lip Glaze in a choice of colours for £15 from Birchbox. The Green People Intensive Repair Shampoo is a natural shampoo for hair that needs a little TLC (think coloured hair or dry hair). It is free of silicones, SLS, parabens and artificial fragrances and contains organic green tea, aloe vera, yucca, orange and sandalwood. I’m so thrilled to finally receive another natural shampoo in my Birchbox! There have been a few hair products that I have not been able to test out and that I have had to give away to others, but this is one that I could actually test out. 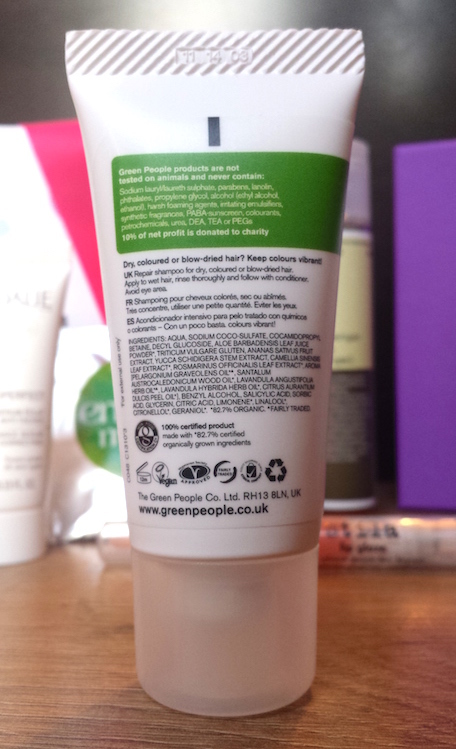 The Green People Intensive Repair Shampoo has the colour and smell of green tea and it lathers up well on the hair. You don't need to use a lot to achieve a decent lather either. It rinses easily, too. I followed it up with Roots & Rituals Conditioner and my hair was left feeling and looking clean and healthy. I like this shampoo. It is one that I have considered buying before and after testing now I would recommend it to others. Whether you already enjoy using natural shampoos or if you're considering making a swap, it's good for either type of person to give a go. 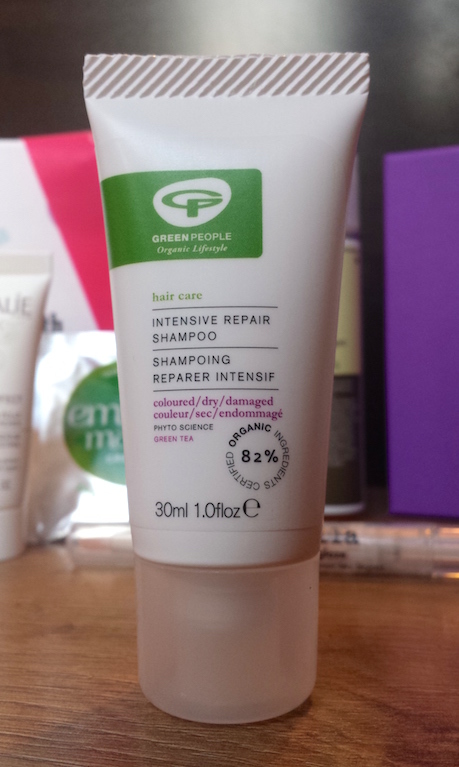 You can buy a full-size, 200ml bottle of Green People Intensive Repair Shampoo for £11.95 from Birchbox. 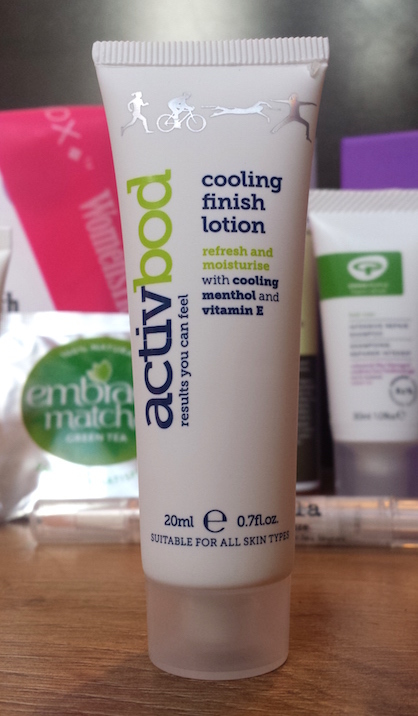 Activbod’s Cooling Finish Lotion is a moisturiser that is designed for use post-workout. This moisturiser is packed with menthol which provides a cooling sensation for the skin, but it also contains vitamin E to help soothe dry skin and eucalyptus, pepper, and lemon to give it an energetic, fresh scent. I found the cooling sensation to occur quite quickly and it was rather refreshing. It absorbed into the skin really fast too, and the scent is a zingy lemony-pepper type smell. I didn't find it to be the most moisturising lotion I've ever used, but the skin was left feeling soft as well as cool after application. In a way it reminds me a little of The Body Shop's Body Sorbet (it's the cooling sensation), but it has a totally different texture, being like a gel rather than a sorbet. I can imagine this being handy post-gym, but that’s something that I can’t try out right now! 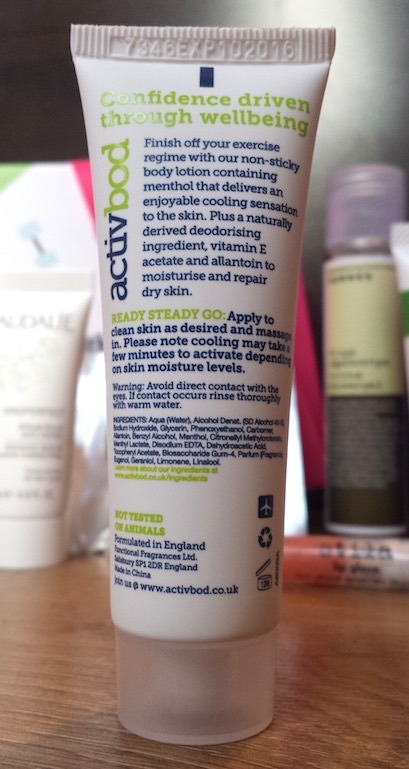 You can purchase a full-size, 100ml bottle of Activbod Cooling Finish Lotion for £12 from Birchbox. The Korres Citrus Shower Gel is a body wash that provides hydration to the skin as well an uplifting, fresh scent. It’s great for a morning wake-up and the wheat proteins provide a thin layer on the skin to help prevent it from drying out. Whilst Korres use a lot of natural ingredients and this shower gel is free of parabens, SLS is still included in the formula. The first thing that I noticed during use of the Korres Citrus Shower Gel is that it is quite fast flowing. What I mean by this is that when the bottle was tipped slightly the product came gushing out. I can’t say for certain if this is an issue with the full-size bottle though as I’m not sure if the bottle lid is a screw cap or a flip cap! It creates a good lather on the skin and is spreads pretty far. The smell is quite a masculine citrus, just like the moisturiser is. It rinses easily and it leaves the skin feeling refreshed and clean. I like the Korres Citrus Shower Gel, but when I look for natural products I do prefer them to be SLS free as well. It’s something to keep in mind if you are also a fan of natural skincare! 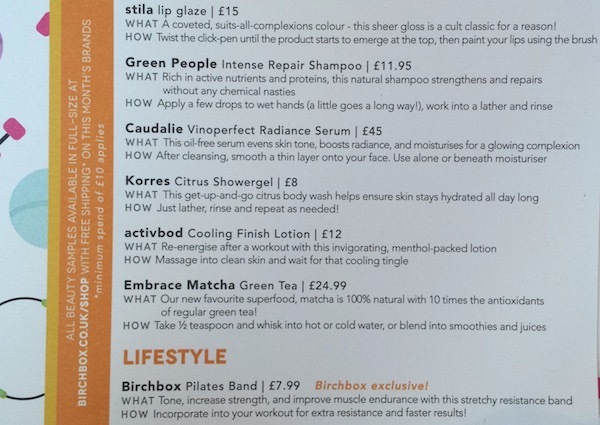 You can buy a full-size, 200ml Korres Citrus Shower Gel for £8 from Birchbox. I’m a huge fan of green tea (and all tea in general), so a tea bag is never going to be snubbed by me! With that said, I simply haven't gotten around to testing this out yet. As soon as I do, I'll let you know how my brew was! 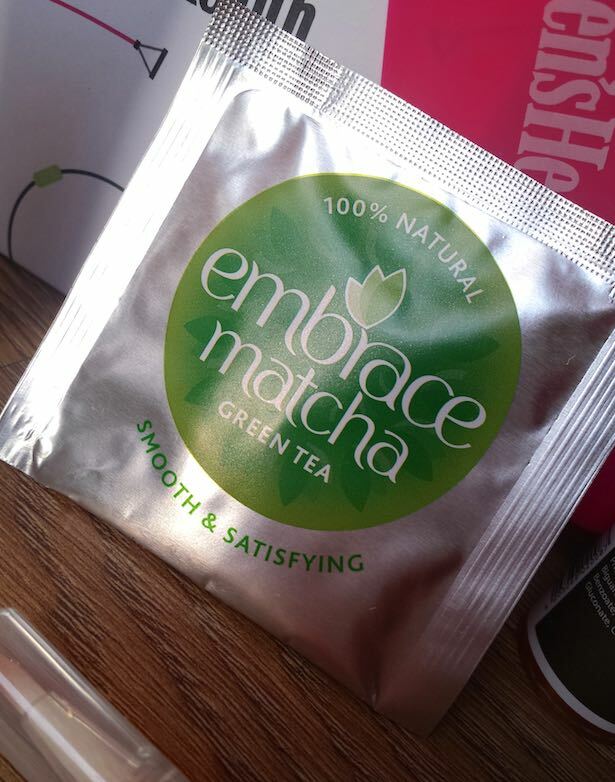 You can buy a box (30 servings) of Embrace Matcha Green Tea for £24.99 from Birchbox. The Women's Health Pilates Band is effectively a large elastic band that can be used in multiple ways to help tone up the body. Whilst I would have been totally up for giving this a try, I’m going to have to hold off from using it for now. I’m in the home stretch of my pregnancy now and even though I’m aware that gentle exercise is fine, getting too active with a pilates band will probably cause me more damage than good at this moment in time! I’m going to be keeping hold of it though as I’m sure I will find it useful when it comes to those toning up exercises post-pregnancy! You can buy your own Women's Health Pilates Band for £7.99 from Birchbox. Overall, I enjoyed the theme and style of this box. I was very happy with the inclusion of natural products to try out and the in box tips regarding ways to "hit refresh" at the start of the new year. 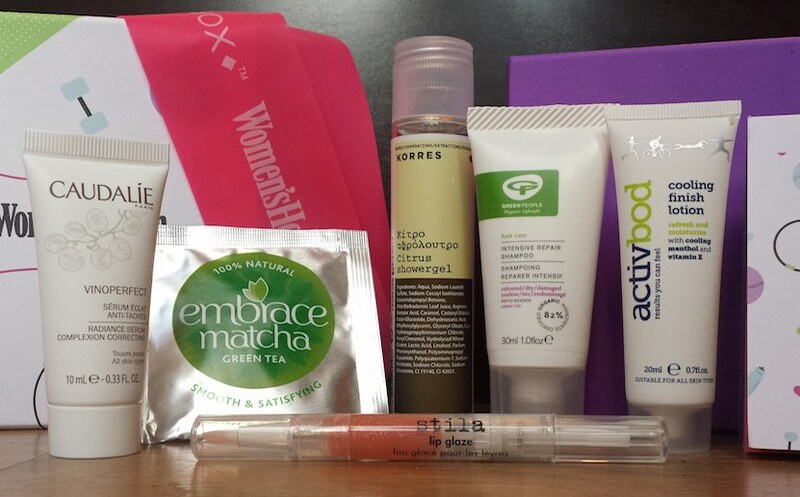 My top picks from this box are probably the Green People Intensive Repair Shampoo and Stila Lip Glaze. Annoyingly though, the new year hasn't brought better delivery with it in regards to Birchbox. I'm really not sure what is going on with the speed of post and packaging over the last six months or so now, but before the issues began the postage was fantastic. Here's to hoping that next month this won't be a problem! This month you can use the code FLAWLESS2015 to receive a free BeautyBlender and full-size Stila Lip Glaze in your first box. The code must be used before January 18th, so if you are reading this after that date then it will unfortunately be too late to use it. It also only works when used alongside a referral link (the "subscribe here" link above is a referral link). Alternatively, you can also use the code JAN5 to receive £5 off the January box.